Nightlife is getting exciting with lots of young people considering that early night is too early to retire to bed. Many get attracted to different kinds of entertainment establishments. Pubs and bars are few such places which attract the young crowd. Some prefer going on a regular basis, while others visit only occasionally. Bars with dance floors attract a young crowd, while a pub attracts a more matured crowd of executives and senior executives. Since the Bronze Age, ale drinking has been part of the Great Britain culture. However, the Romans and their alehouse for traveler’s refreshment introduced the pub culture. This trend slowly gave way to establishments for drinking, such as public houses, or ‘pub’ in short. The early pubs sold locally brewed ale, which was a fermented drink made of malt. These alehouses became a popular meeting area for locals. This trend changed to become today’s modern pub. Today a pub is a place where one can get drinks during the day and night. They also have food and accommodation facilities for their clients. A bar is often a counter inside a pub, with raised brass railings running around the table bottom to facilitate leaning and leg resting when using the high bar stools. The bar allows the customers to play pool, darts and billiards. Some bars also have lounges. These lounges offer a comfortable place to sit and catch up with conversation. Even though food and drinks are available in plenty, bars do not have accommodation facilities like pubs. Most of the star hotels have some space allocated for bars. The name of the bar, interiors with lightings, a unique list of drinks, and other elements are added to give the bar extra appeal to attract clients. A bar operating with only one theme could end up attracting a different target group. A bar with a dance floor could be popular among young people. A bar playing blues music could attract bikers. There are different kinds of bars based on different themes, such as retro and executive lounge bars. Today there are number of bars and pubs in all of the major metros. Pubs are fighting with bars to attract the young and old with their unique offerings of music, DJ’s, big names and interior design with celebrity attractions. 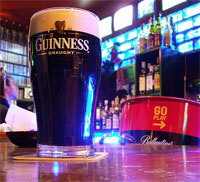 Pubs are just around the corner for a neighborly visit, while bars are becoming a posh culture. 1. A bar is a place which plays loud music, sells alcoholic drinks and has a dance floor. This place is more for people who love drinking, and serves little or no food. 2. Pubs have alcoholic drinks served in a serene atmosphere filled with soul soothing music and food. They offer a wide variety of snacks to accompany the drinks. 3. Bars attract a younger crowd, while the pubs attract a more mature crowd. Manisha Kumar. "Difference Between Bar and Pub." DifferenceBetween.net. January 3, 2010 < http://www.differencebetween.net/miscellaneous/difference-between-bar-and-pub/ >.